What exactly are we trying to illuminate? What are we truly trying to understand? Why are we trying to understand, to what end, for what purpose? What difference will it make if we understand? Which questions do we ask in order to elicit the answers that will actually illuminate? It was once said that research proves what you want it to prove, so what exactly are we trying to prove with by ‘illuminating learning’? For me and all at humanutopia, our mission for the past 13 years has been to ask young people to be honest, brutally frank about their perceptions of school and their educational journey. We have tirelessly provided young people with a forum and platform from which to express their views and share their perspectives and experiences of school. Our primary purpose was motivated by a deep desire to create decisive moments, in which the life of the young person changed course, because they truly and deeply understood their own behaviour and were then able to change if so desired. Our secondary purpose was to disrupt. We wanted the voices of young people to be heard, we wanted to become advocates for their concerns, to highlight the inadequacies of our education system and shine a light on its frailties, inconsistencies and hypocrisies. Why contribute to Illuminating learning? My desire in contributing to illuminating learning is that we are trying to gain a deep grasp of what the journey through school feels like for a young person. In doing so, we as adults, decision makers and policy writers can improve this experience for all future children regardless of their background, heritage or culture. So, what questions do we need to ask in order to gain this place of deep, empathetic knowledge? When asking these questions, it is difficult not to let it sound like an attack on teachers. Categorically I stress it isn’t; these questions are aimed at our society and our education system. In Africa, it is said that ‘it takes a whole community to raise a child.’ I therefore urge you, the reader, to assess these questions from a systemic and societal standpoint, so that collectively we can be better informed about the perceptions of young people and subsequently create a much more relevant and accessible educational journey. So, as a teacher, please review these questions from a personal standpoint and from a corporate perspective, ie on your school’s behalf. How do you respond if or when a child struggles in class? Does your school focus on strengths or weaknesses? What is the main focal point of your school culture and your professional dialogue? Does it emphasise or encourage failure? Does the culture of your school and its lessons help students feel good and bounce back? Or do students feel demoralised and demotivated after setbacks? How are creativity and innovative thinking used on a daily basis in your classrooms? It is now common knowledge that the right brain is key to creativity and innovation, so just how do you encourage students to create and innovate? How often do you encourage your staff and students to take risks and allow them to have extraordinary experiences of discovery in a normal day? Is wellbeing at the heart of your school? How do you and your colleagues ensure that the welfare, happiness, mental health and wellbeing of all stakeholders is at the very core of all discussions, meetings and actions during any given school day? If this isn’t happening, what can you do to ensure this agenda becomes central to a school’s daily heartbeat? How is critical thinking used on a daily basis in your classrooms? Einstein once said, ‘Imagination is more important than knowledge.’ So in a world that requires us all to solve problems of varying sizes on a frequent basis, shouldn’t we be building our lesson structures around real and relevant problems? That would help to enable and empower students to use their imagination and unlock their creativity and innovative powers. How do you train staff to identify and deal with the social challenges affecting students? How do you make staff aware of the key social challenges facing young people? How do you get adults to remember how subtle peer pressure can be, or how to spot a subversive pecking order and its negative impact on a class or year group? How do you support staff to identify and address some of these highly destructive influences? Do you measure how happy your students are at school? A 10-year-old boy once asked me, ‘Why don’t Ofsted measure how happy we are in school?’ I had no answer to match his insightful question. Why don’t we? 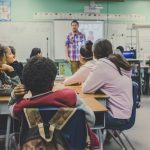 With the boom and plethora of online measuring and evaluation tools, it is far easier now to assess just how young people are feeling about many things, including school. Maybe understanding what makes young people happier could help us restructure our curriculum? Many progressive staff and schools already build their assignments and lesson outcomes around trying to help students develop skills and experiences. They understand that if students feel they are growing from a lesson, there will be a natural upward correlation with their performance. Conversely, it is a fear of failure that causes many students to under-perform. How exactly is learning personalised in your classrooms? In the school? To what extent do you and your staff assess, know and respond to the individual learning styles and needs of each young person? What tools do you have to assess these important aspects of any educational journey? After the initial hype and response to learning styles and multiple intelligences, these wonderfully illuminating concepts seem to go largely unused in too many schools. What learning models do you use (eg, project-based learning, mobile learning, game-based learning)? All manner of exciting curriculum innovations are springing up across the globe. Whether it be a coding project from Khan Academy, the latest app like Quizlet to develop language skills, a highly acclaimed Finnish model where students run their local bakery, or the latest problem-solving project from Edutopia, there are hundreds of highly creative and relevant programmes now out there, made even more accessible online. What are the more uncommon barriers to academic progress in your classrooms? Do you and your staff really know and empathise with the most common barriers to progress? Do you really cater for dyslexia? Are your staff aware of how to spot signs of dyspraxia and how best to support the many young people who struggle with this largely unknown condition? What provision is in place for young people whose confidence is worryingly low and who are painfully shy? Do you have targeted workshops to rebuild their self-esteem? Is your school a school of hope? Just how are the individual learning needs and styles of each student assessed, prescribed and monitored? Why not spend years 7 and 8 using project-based activities to observe and assess the tendencies of each student? Why not ask students to solve problems, collaborate and innovate in order to help them, and your staff, better understand their preferred needs and styles? How do you listen to every student voice? I still visit schools that employ what I believe to be a largely outdated vehicle for student voice, in which one member of a class or year group represents an entire cohort. True, at least the school is trying to give students a voice, but many others have a voice that never gets heard using this system. Lots of staff and schools now are taking brave steps to use social media and in-house platforms which give young people a forum on which to share their concerns and lesson experiences. What is the rank order of priorities of students at your school? Have you ever gone to the trouble of trying to find out just what are students’ priorities in life and school? I ask every single group of students I work with to identify and share their most important priorities in life: their feedback is both humbling and illuminating. Much can be learned by asking young people what they really care about, and what they worry about most. Do students survive or thrive at your school? Surely this is one of the most fundamental questions we can ask of ourselves and our school: just what we are you setting your students up for – a life of mediocrity or, even worse, anonymity? Or do you and your staff provide young people with the opportunity to live a life of excellence and self-realisation? How do you know you’re really making an impact on each and every young person? John Hatty’s work on attribution has highlighted the need to help young people redefine the factors they can control to improve performance, rather than embracing things they have little or no control over. The same can be said of a teacher’s influence: what can a teacher do to positively influence the behaviour and attitude of a young person? And how can they assess this impact and influence? How do you know what your students’ daily diet is? Has anyone on SLT shadowed a student for a whole day? Just what do you and your staff do to monitor, evaluate and report on the journey of any given student? How do you go about observing, subjectively from a student’s standpoint, but then objectively assessing what can be done to improve and embellish the experience of their journey through school? How can you measure and share these profound observations with your colleagues? What are you not asking but should be? By way of summary, I have saved my favourite question to last. How can you truly illuminate the learning of students at your school? In order to truly understand, empathise with and improve provision for your young people, what questions are you not asking which really you ought to be, every day, every week, every month, every year? I sincerely hope you can use at least one of these thought-provoking questions to begin an authentic and powerful process. A process through which you truly engage and understand the wonderful young people that grace every school and every lesson, with the vision and deep commitment to improve their educational journeys and the overall impact on their future.